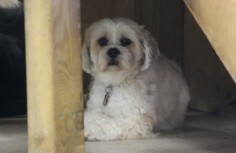 #2 Because we don’t have crates or kennels, our dogs are 100% supervised indoors and outdoors. #3 Boarding Kennels were designed to house dogs over night. So this limits their play areas to outdoors ONLY. This is sometimes a play where there is a lack of supervision. Not to mention if it is hot or raining outside, that will limit their play. Our 2400sqft facility was set up for indoor play in mind. 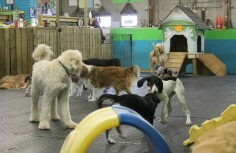 We go outside hourly for potty breaks, but the majority of our play is done inside our heated/air conditioned play yard. Because we allow our dogs to play inside, and potty outside. We actually aide in the puppy training of your dog. #4 Our outdoor yard has different surfaces to teach your dogs to go to the bathroom anywhere you need them to go. You will find this handy when you are traveling with your dogs, and can’t find grass. The other reason….the main reason for the yard set up is cleanliness. If it rains your dog will not come home muddy. Our yard also has a 10×20 canopy for cooling purposes and dogs not liking the rain. 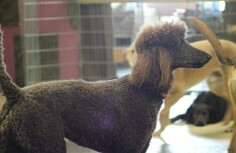 #5 Unlike a boarding kennel we do not have set drop off times and pick up times. You can drop your dog off when you need and pick when you would like. They are your dogs . We are always here to supervise them. All of this without a pesky appointment. We understand that life is heckic enough without you worrying if you made an appointment for a play day for your pet. #6 Because our dogs are intermingling all day our staff is trained in k9 first aide, behaviour modification, learning theory and body language. We also have certified accredited trainers and educators. At a boarding kennel if a dog misbehaves they just put them in a cage. Where we are always here, so we can work on the problem. #1 People think that caring for dogs is a quick and easy way to make money. Generally these types of daycare have no education on dogs and their behaviour, which makes this a breeding ground for fights and injuries. Fido’s Playground has accredited dog Trainers and a vast collection of books that we use to educate our Co-op students and our customers. We are linked to other experts in the field via clubs such as the Canadian Kennel Club, and the American Association of Pet Dog Trainers. We also attend seminars yearly to learn from the best of the best in the dog training world. #2 Home daycare are in a house that is full of furnature. This does not give very much space for playing. Little known fact! Dogs pee on furniture. All it takes is one dog to start. Then let the peeing frenzy begin. 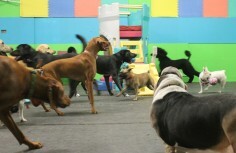 At Fido’s Playground our 2400sqft space is WIDE OPEN and designed just for the dogs. That is larger than most homes. And that is not including our outdoor yard. We do not have furniture for the dogs to pee on and harbor harmful bacteria. We do have plastic play equipment (easy to clean), raised dog houses, andwater proof dog beds. Also our floor is environmentally safe epoxy flooring with ¾” rubber. #3 You would think that at a home daycare supervision would be at its beat. But unfortunately it is TOO easy to put the dogs outside while you do laundry and clean the house. At Fido’s this is not our house, nor do we live on the property. This is our job and we take it very seriously. We have seen too many dogs get treated improperly. We are here to socialize your dogs in the best way possible. 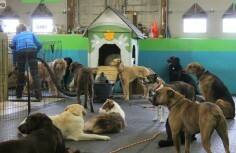 #5 What happens if your dog is injured at a home daycare? Or what if you are injured picking up your dog? Is there any risk of a home daycare being shut down? 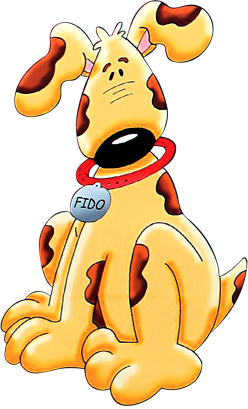 At Fido’s we are licensed and Insured for just that reason. Also because the towns by-laws limit people from housing more than 3 dogs in a residential area. And overnight boarding is strictly prohibited with in town limits We have no risk of being asked to shut down because we didn’t follow the rules. We are located in an industrial area where daycares belong. Need any more questions answered about the difference. Stop in and check us out. Seeing is believing! Playtime is the best time for every dog. When Mom or Dad come to pickup the dogs, they aren’t always ready to go home.